Each of these articles will appear at 7am GMT on the day specified. If you try to click on the links below before the appointed time, you will get a “page not found” message. Please be patient! 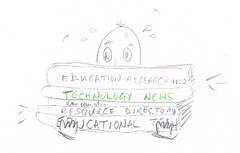 (Or sign up to Digital Education and read them right away <evil grin>). Monday 7:00 Amna: Internet Safety Amna is a Junior School pupil. Tuesday 7:00 Simon Finch: Lazy e-safety messages are no help to our children. Simon publishes the Digitally Confident website. Wednesday 7:00 Ellie Gregson: Young people and the internet Ellie is a secondary school pupil. Thursday 7:00 Alan MacKenzie: Practical advice for parents to keep their children safe online Alan publishes the e-safety adviser website.